After the holidays, I decided I was feeling a little, oh, I don’t know… peaked isn’t quite the right word. You know how you feel when you’ve over-indulged in too much rich food, too many glasses of wine and, just possibly, a bit more “enriched” eggnog than is absolutely necessary? No, hangover isn’t the right word either. Sluggish is more like it. And my waistband was overtaxed, shall we say. I realized I’d fallen into some bad habits and decided to take drastic measures. I’ve never done a juice cleanse thing, but it seemed that several days of a liquid fast and no alcohol could only do my liver body good. I needed a complete reset. So I Googled and I researched. And, as I have done with so many things in my life, I decided to wing it. There’s the so-called lemonade that is the basis of the Stanley Burroughs’1 Master Cleanse that originated in the 1940s and has been practiced by Beyonce, Angelina Jolie and Jennifer Aniston to name a few. I like the lemonade. It has ingredients that I enjoy – lemon juice, maple syrup and cayenne in lukewarm, purified water. I go a little heavier on the cayenne in the recipe than is strictly necessary… It’s supposed to act like an appetite suppressant, the maple syrup serves to keep you alive and the lemon juice flushes out your liver! After the first day or two of this regime, it’s started to be somewhat satisfying. Or maybe my stomach just got used to nothing much heading its way. But, I’m not doing the Master Cleanse because I actually do require some sustenance so I’ve added two smoothies a day to my intake. 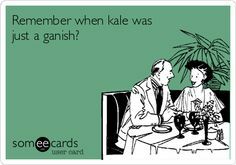 From my research of other juice cleanses, it’s obvious that kale is pretty much a staple. I like kale. Some kale. Fine Cooking has a great recipe for Tuscan Kale with Shallots and Crisp Salami that I make all the time; however, the kale is somewhat cooked, and there’s butter involved. In preparation for this undertaking, I bought a big bag of kale (already de-stemmed and washed), some mangoes, kiwis, blueberries, oranges, cucumbers, apples – basically just browsed the produce section and picked up what appealed – along with my truckload of lemons. I also bought aloe water and coconut water to smooth out the smoothies. I’ve got to tell you, if you can get past the color, these smoothies are so delicious. My favorite so far is the mango, blood orange, kale and coconut water combo. It occurred to me that it would be great with a splash of rum, but that would be self-defeating. The tiny specks of kale in the smoothie actually give me something to chew, so there’s that. Not being a big lover of sweets, I got desperate for something salty instead, so made a smoothie for “dinner” comprised of spicy V8, kale, lemon juice and cayenne (I think the cayenne is supposed to be good for something and I like spicy). Wonderful! Like chilled gazpacho, but not really. Oh yeah, and I’m drinking about a gallon of water (flavored with cucumber slices) every day. I have no idea whatsoever what this cleanse I’ve cobbled together is doing, but I know I’m falling asleep at about 8 p.m. and I’m not missing potato chips or wine spritzers. At least not today. While this wasn’t a New Year’s resolution, the holidays did spur this attempt to get my system under control. Have you felt inspired to get healthier this month? Any suggestions? 1 Burroughs was convicted of manslaughter for practicing the healing methods described in his work. Sign me up Babe. I will be calling you for inspiration and recipes. And Cara just bought a VitaMix so she will be all over this too!!!! Hugs!!! I don’t do drastic changes, but rather every day is a mini battle of what I want to eat versus what I ought to eat! …(hit send too soon) so complacent that I didn’t even question that bag of chips/crisps, or the extra Christmas cookie, or the bonus glass of spirits before bed. That’s part of my hoped for reset. Fingers crossed! 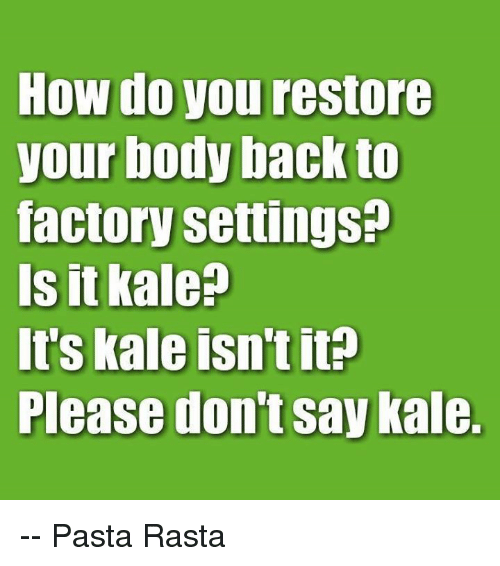 Leave a reply on "Kale!"